These Terms and Conditions apply to hotel accommodation contracts as well as to all further services and deliveries provided by the hotel to the guest (hereinafter also referred to as the customer). Any subletting of the rooms, areas and show cases made available by the hotel as well as all job interviews, sales events or similar events shall require prior written consent from the hotel. Deviating provisions, even where they are contained in general terms and conditions of the guest or the customer, shall not apply unless explicitly acknowledged in writing by the hotel. The accommodation contract shall be concluded as soon as rooms, premises or other deliveries and services have been ordered by the guest and agreed by the hotel. All reservations will be confirmed in writing by Frechener Hof Hotelbetriebs GmbH. Where this is no longer possible due to time constraints, the customer will receive a reservation number by telephone. Should the reservation confirmation deviate from the contents of the reservation, the contents of the reservation confirmation shall become contents of the contract unless the guest objects to it immediately after its receipt, yet no later than on acceptance of the services. The conclusion of the accommodation contract shall place the contractual partners under the obligation to fulfil the contract, no matter for which period of time the contract has been concluded. The contractual partners shall be the hotel and the guest. Where a third party makes the booking on behalf of the guest, the third party shall be liable to the hotel together with the guest as joint and several debtors for all obligations arising under the contract, provided a corresponding statement from the customer has been submitted to the hotel. Regardless thereof, every customer shall be under obligation to forward all booking-relevant information, especially these General Terms and Conditions, to the guest. The hotel shall be under obligation to keep the rooms booked by the customer ready in accordance with the General Terms and Conditions and to provide the agreed services. The guest shall be under obligation to pay the prices of the hotel, which are applicable or have been agreed for provision of the rooms and for the services utilised by the guest. This shall also apply to the provision of services and to expenses of the hotel, which the guest or the customer has arranged for the benefit of third parties, as far as such expenses and services have been agreed by contract or approved by the guest. The prices agreed shall include the respective value-added tax. Where the period of time between conclusion and performance of the contract exceeds four months and the price generally invoiced by the hotel for such services increases, this may lead to an appropriate rise in the contractually agreed price, yet by no more than 10%. Should the legislator pass an increase in the value-added tax rate, the hotel will adjust the overnight accommodation prices correspondingly. Should another hotel-specific charge or tax within the respective municipality be resolved by the legislator at short notice or for a certain period of time, this charge or tax will be passed on directly by the hotel to the guest. In general, the remuneration for services booked shall be due for payment before departure of the guest. Prices may also be changed by the hotel if the guest requests subsequent changes to the number of rooms booked, the services to be provided by the hotel or the duration of stay of the guests, and if the hotel complies with such a request. assert more far-reaching compensation for damages. The hotel shall be entitled to demand an appropriate advance payment or security deposit on conclusion of the contract or later on. The amount of the advance payment and its due date may be agreed in writing in the contract. Moreover, the hotel shall also be entitled, at any time during the stay of the guest in the hotel, to declare due any accrued accounts receivable through issuing an intermediate invoice and demand immediate payment. The guest shall only be entitled to set off his undisputed or finally established accounts receivable against accounts receivable of the hotel or to reduce his payments of hotel prices correspondingly. Where rooms or other services are reserved on an optional basis, the data of the option shall be binding on both contracting parties. Following expiry of the agreed option period, the hotel shall be entitled to dispose without restriction of the rooms and services having been booked on an optional basis. Possibly granted special conditions must be mentioned directly during the booking process or on arrival of the guest. Later changes or reductions shall not be possible. To guarantee a reservation and the resulting services, Frechener Hof Hotelbetriebs GmbH shall be entitled to require a valid credit card number of a credit card company accepted by Frechener Hof Hotelbetriebs GmbH from the guest. The exclusive invoice currency shall be EURO. Where the invoice amount exceeds three times the overnight accommodation price, Frechener Hof Hotelbetriebs GmbH shall be entitled to issue intermediate invoices in each case, for instance in the form of weekly invoices, and to demand payment of such invoices from the guest. Intermediate invoices shall be payable by the guest immediately after receipt. Where the guest comes in default with his payment of such an invoice, the hotel shall be entitled to cancel the agreement with immediate effect. 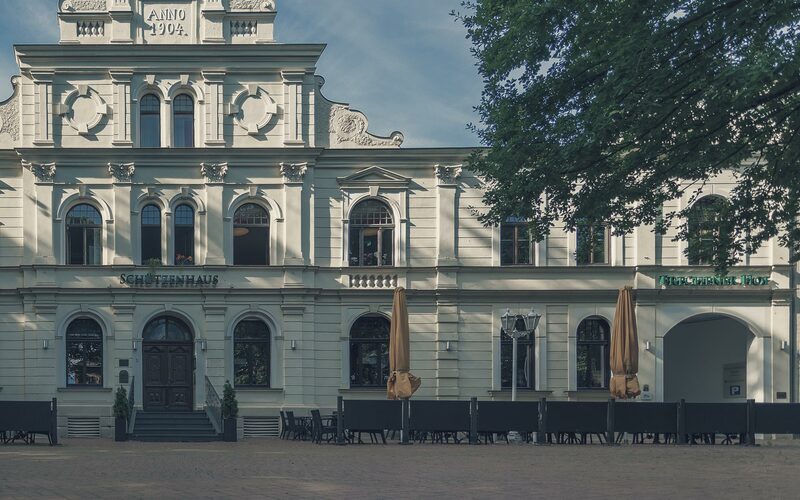 Frechener Hof Hotelbetriebs GmbH reserves the right to assert further costs such as the loss of profits if hotel facilities cannot be rented out to other customers. Invoices to companies, travel agencies etc. will only be issued if the invoice recipient submits a written cost assumption statement to the hotel on its official company letterhead and if this statement is accepted by the hotel. Such invoices shall be payable within ten days after the date of the invoice, without deductions and in the currency stated on the invoice. The place of performance for payment obligations of the guest shall be the registered office of the respective hotel. This shall also apply if the payment was credited to the guest. In the event of delayed payment, Frechener Hof Hotelbetriebs GmbH shall be entitled to charge interest of at least 5% above the nominal ECB interest rate. The right to charge higher compensation for damages as a result of the delayed payment shall remain unaffected. For each and every payment reminder, a flat-rate fee of EUR 15.00 shall be invoiced. The acceptance and selection of credit cards shall be at the free discretion of Frechener Hof Hotelbetriebs GmbH in every individual case even if the general acceptance of credit cards is indicated through public notices at the hotel. Apart from that, the acceptance of cheques, credit cards and other means of payment shall only take place on account of performance. Prices for groups shall only apply on the basis of a separate written agreement. Apart from that, the effectiveness of every group reservation shall be subject to the provision of an advance payment, the amount of which must be at least 75% of the service to be reserved. For the reservation to become legally effective, Frechener Hof Hotelbetriebs GmbH must have received the advance payment two weeks before arrival of the group. In the case of group reservations, the hotel reserves the right to reduce the contingent of not utilised rooms and/or change the agreed price if less than 75% of the rooms agreed are utilised. The hotel grants the guest a right to withdraw from the contract at any time. Withdrawals in case of group reservations shall be subject to the point in time specified in the accommodation contact. appropriate compensation. The hotel shall be at liberty to demand flat-rate withdrawal compensation from the contractual partner Instead of a specifically calculated compensation. The flat-rate withdrawal compensation shall amount to 90% of the contractually agreed amount for overnight accommodation with or without breakfast. More than 30 days: Provision/preparation costs will not be invoiced. Up to the 15th day: Provision/preparation costs will be invoiced. 14th to 8th day: Provision/preparation costs will be invoiced, plus a compensation of 33% of the lost sales revenue (food & beverages). Where the sales revenue was not yet specified, the minimum menu price (convention) x number of persons shall be payable. 7th to 3rd day: Provision/preparation costs will be invoiced, plus a compensation of 66% of the lost sales revenue (food & beverages). Where the sales revenue was not yet specified, the minimum menu price (convention) x number of persons shall be payable. Within 72 hours: Provision/preparation costs will be invoiced, plus a compensation of 90% of the lost sales revenue (food & beverages). Where the sales revenue was not yet specified, the minimum menu price (convention) x number of persons shall be payable. Where the hotel has granted the guest an option to withdraw from the contract without further legal consequences within a certain time limit, the hotel shall not have any claim for compensation. The question of whether the withdrawal statement has been submitted in due time shall depend on the statement’s receipt by the hotel. The contractual partner must declare withdrawal from the contract in writing. Where the guest has been granted a right of withdrawal free of charge under § 4, the hotel shall likewise be entitled to withdraw from the contract within the agreed period of time if requests from other guests regarding the rooms and event premises booked have been received and the guest does not finally confirm the booking after a corresponding inquiry from the hotel. If an advance payment or security deposit agreed pursuant to §3 Subsection 6 is not provided within a time limit stipulated for this purpose, the hotel shall likewise be entitled to withdraw from the contract. insolvency proceedings have been opened against the assets of the guest or if the opening of such proceedings is rejected for lack of sufficient assets or because of other reasons. The hotel shall inform the guest in writing and without undue delay about its exercise of the right of withdrawal. In the aforementioned cases of withdrawal, a claim for compensation of the contractual partner shall not arise. The guest will not acquire any claim for the provision of certain rooms unless the hotel has confirmed the provision of certain rooms in writing. Should any agreed premises not be available, the hotel shall be under obligation to endeavour providing equivalent substitute premises at the hotel or in other facilities. The contractual service scope of the hotel shall result from the written concluded agreements. Where the guest does not utilise a booked meal, i.e. breakfast, no matter because of what reason, he shall neither have a claim for reimbursement, including on a pro-rata basis, nor a claim for reduction of the price. Unless otherwise agreed in writing, rooms reserved shall be available to the guest on the day of arrival from 3:00 pm onwards and must be left on the day of departure by 11:00 am. Rooms booked shall be occupied by the guest no later than at 6:00 pm on the agreed day of arrival. Unless a later time of arrival has been agreed specifically, the hotel shall be entitled to allocate the rooms booked to other guests after 6:00 pm without the guest being entitled to derive any claim for compensation from such allocation. The hotel shall have a right of withdrawal in this respect. The reservation data shall be binding on both contracting parties. Rooms reserved shall only be available to the service recipient for the agreed period of time. Any utilisation of the rooms reserved beyond the agreed period of time shall require consent from the hotel. Where it is foreseeable for a guest that he/she will depart after 11:00 am, the reception shall be notified of this fact no later than at 9:00 pm on the evening before. Afterwards, the hotel shall be entitled to charge the day room price for additional utilisation of the room until 3:00 pm in addition to the damage, which the hotel has incurred as a result of such belated departure. From 3:00 pm onwards, the hotel shall be entitled to claim 100% of the full applicable lodging price. The guest shall be at liberty to provide evidence to the hotel that the hotel has incurred either no damage at all or essentially lower damage. The guest or the organiser shall be liable to Frechener Hof Hotelbetriebs GmbH for any damage caused by him or by his guests. Frechener Hof Hotelbetriebs GmbH shall not be liable to the guest or the contractual partner if provision of the services becomes impossible due to a strike or as a consequence of force majeure. In these cases, Frechener Hof Hotelbetriebs GmbH will endeavour to procure equivalent alternative services. Should disruptions or defects occur with respect to the services provided by the hotel, the hotel will endeavour to provide remedy following an immediate complaint by the guest. Where the guest culpably omits to notify the hotel of a defect, a claim for reduction of the contractually agreed remuneration shall not arise. The hotel shall be liable, in accordance with the statutory provisions, for any damage resulting from an injury to life, body and health. The hotel shall only be liable for other damage caused by slight negligence if such damage is attributable to the infringement of an essential contractual obligation or a cardinal obligation, which has been committed in a manner endangering the purpose of the contract. In these cases, the liability shall be limited to the foreseeable damage typical of this kind of contract. As for other damage, the liability of the hotel in excess of the aforementioned scope of liability shall be limited, for every individual event of damage or loss and for all events of damage or loss arising from and relating to the contractual services, to the maximum amount of € 100,000.00 for damage to property and to the maximum amount of € 100,000.00 for financial damage. The limitation of liability and the exclusions of liability shall not apply if the other damage is attributable to a wilful or grossly negligent infringement of duties on the part of the hotel, its legal representatives or its managerial employees. Except in cases of liability for a defect after the assumption of a guarantee for the quality of objects or works, in cases of maliciously concealed faults or in cases of damage to persons, the aforementioned limitations of liability shall apply to all claims for damages regardless of their legal basis including to claims because of impermissible acts. The aforementioned limitations of liability shall also apply in cases of possible claims for damages of a contractual partner against employees or auxiliary persons of the hotel. For objects, which the guest has brought to the hotel, the hotel shall be liable to the guest in accordance with the statutory regulations, i.e. up to 100 times the accommodation price, yet no more than € 3,500.00. For valuables (cash, jewellery etc. ), the liability shall be limited to € 800.00. Money and valuables kept in the hotel safe shall be insured up to the maximum value of € 25,000.00. The hotel recommends making use of this opportunity. The liability claims shall expire if the guest does not notify the hotel immediately after the respective loss, destruction or damage has come to his knowledge. As far as parking place in the hotel garage or on a hotel car park is made available to the guest, including in return for a fee, this shall not constitute the conclusion of a custody agreement. The hotel shall not be under any surveillance obligation. Where motor vehicles parked or shunted on the hotel premises and the contents of such vehicles are lost or damaged, the hotel shall not be liable except in cases of its wilful misconduct or gross negligence. This shall also apply to the hotel’s auxiliary persons. The damage must be asserted towards the hotel no later than at the time when the guest leaves the premises of the hotel. Wake-up calls will be carried out by the hotel with the greatest possible care. Claims for damages except because of gross negligence or wilful misconduct shall be ruled out. Messages, mail and goods consignments for guests will be handled with care. The hotel will take charge of delivery and storage and, on request, of subsequent forwarding of such messages, mail and goods consignments in return for a fee, including lost property upon a corresponding request. Claims for damages except because of gross negligence or wilful misconduct shall be ruled out. The hotel shall be entitled to hand over the aforementioned objects to the local lost property office at the latest after a storage period of one month, thereby charging a reasonable fee in return for its activities. Claims for damages of the contractual partner shall come under the statute of limitations no later than two years after the point in time, at which the damage came to the knowledge of the contractual partner or, without respect of such knowledge, no later than three years after the point in time, at which the incident causing the damage occurred. This shall not apply to the liability for damage resulting from an injury to life, body or health and for other damage based on a wilful or grossly negligent infringement of duties on the part of the hotel, a legal representative of the hotel or an auxiliary person of the hotel. In the event of conveyance free of charge of the guest by Frechener Hof Hotelbetriebs GmbH, the liability shall be limited in accordance with the motor vehicle insurance for damage to persons and damage to property. Animals cannot be accommodated at Frechener Hof Hotelbetriebs GmbH. The accommodation of an animal by a guest shall entitle Frechener Hof Hotelbetriebs GmbH to terminate the contract without notice. In these cases, the hotel shall also be entitled to the agreed remuneration. During events, it shall be ruled out in principle for guests to bring their own food and beverages to the hotel. Decoration of the event premises shall require a separate agreement unless such decoration is limited to mere table decoration. Changes or amendments to this contract, to the acceptance of a proposal or to these General Terms and Conditions for hotel accommodation shall be made in writing. Unilateral changes or amendments by the contractual partner shall be ineffective. The place of jurisdiction shall be Cologne / Germany. The exclusive place of jurisdiction including for disputes regarding cheques and bills of exchange in commercial business dealings/dealings with businessmen shall be the registered office of the hotel or a place at the choice of the hotel. Where a contractual partner does not have a general domestic place of jurisdiction, the registered office of the hotel shall be the place of jurisdiction. However, the hotel shall also be entitled to bring legal action and institute other court proceedings at the general place of jurisdiction of the guest. Should individual provisions of these General Terms and Conditions for hotel accommodation be or become ineffective or null and void, the effectiveness of the other provisions shall remain unaffected. Apart from that, the statutory regulations shall apply. To become legally effective, amendments, changes and ancillary agreements (no matter of what kind) shall require written confirmation from both contracting parties.